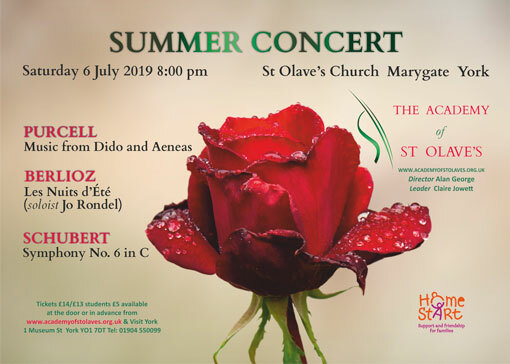 The Academy of St Olave’s is the City of York’s leading chamber orchestra, based in the beautiful setting of St Olave’s Church, Marygate, in York. Our next concert is on Saturday 6th July at 8 pm in St Olave’s Church York. The concert will be in aid of Home Start, with a wonderful programme of music including Schubert’s 6th Symphony, music from Purcell’s Dido and Aeneas and Berlioz Les Nuits d’Été, sung by Jo Rondel. Come to our next Concert in St Olave's Church York! St Olave’s Church can be accessed with a wheelchair. There is a sloping path which avoids the main steps up from Marygate and a wheelchair accessible toilet at the back of the church. The ticket prices are £14, £13 for concessions and £5 for students. Buy in advance or on the day. Buy at the concert venue, from 1 hour before the start of the concert. Please note that online ticket purchases are fulfilled by Web Ticket Master, so the Buy Tickets Online button will open the Academy of St Olave’s ticket page on the Web Ticket Master website.